Many of us struggle with finding our place in this world. The combination and placement of the planets in the natal chart will form a picture of your life. 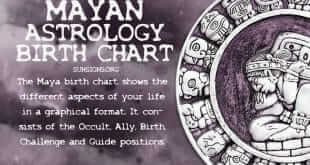 Your Mayan Astrology Birth Chart is displayed as a beautiful work of art of the glyphs of Mayan culture.